On the occasion of Eid al-Fitr, I extend my best wishes to the families of martyrs, families of Peshmergas, and congratulate the Muslim sisters and brothers in Kurdistan and around the world. In this Eid, we appreciate and remember our highly-esteemed martyrs. We salute those who made the ultimate sacrifice for our nation to provide a safer Kurdistan for its people. It is because of their sacrifices we are heading towards a brighter future. I hope this Eid, as it is a celebration of peace and reconciliation, also becomes the Eid that inspires coexistence, harmony, and unity so that we work together to prevail over challenges and address pressing issues; so that we can celebrate our festivities in a Kurdistan, where the rights of all its citizens are guaranteed and protected. Again, I extend my best wishes to everyone on this holy occasion. Prime Minister Nechirvan Barzani received Mr. Amin Awad, UNHCR Director for the Middle East and North Africa Bureau and Regional Refugee Coordinator, and his accompanying delegation. Mr. Amin commended the people and government of Iraqi Kurdistan in hosting and assisting an extraordinary number of people forcibly displaced by the ISIS onslaught and fleeing hostilities in the war to liberate Mosul. Mr. Amin informed that UNHCR is developing a mechanism, in consultation with the KRG, to assist IDPs to return to their homes. In upcoming conferences they will promote the KRG being supported by the international community. Prime Minister Barzani expressed appreciation to the UNHCR for its support to Iraqi Kurdistan. He affirmed that under current circumstances the KRG is not in a position to satisfactorily support such a high number of displaced people. He urged UNHCR to seek and provide adequate assistance. Regarding the return of the IDPs to their place of origin, Prime Minister Barzani stated that stability, security and basic services should be offered for the IDPs to be able to return to their homes. The situation of IDPs and refugees in the region in general and assistance programmes were also discussed in the meeting. Erbil, Kurdistan Region, Iraq (cabinet.gov.krd) – Kurdistan Regional Government Deputy Prime Minister Qubad Talabani met with a number of European leaders during his visit to the continent this week. In the Netherlands, Mr. Talabani met separately with the Dutch Foreign Minister Bert Koenders and Defense Minister Jeanine Hennis-Plasschaert. In the meetings, Mr. Talabani discussed the fight against the so-called Islamic State terrorist organization, Kurdistan Regional Government’s reform programs, and bilateral ties. The Dutch officials praised Kurdistan’s military forces, the Peshmerga, for their fight against terrorists, describing them as a symbol of courage. They also stressed that the Netherlands will will continue to provide military support to the KRG until ISIS is eliminated. Kurdistan Region Deputy Prime Minister also met with officials from the European Parliament. The Kurdistan Region’s fight against terror topped the agenda of the Brussels meetings, along with the scheduled independence referendum. 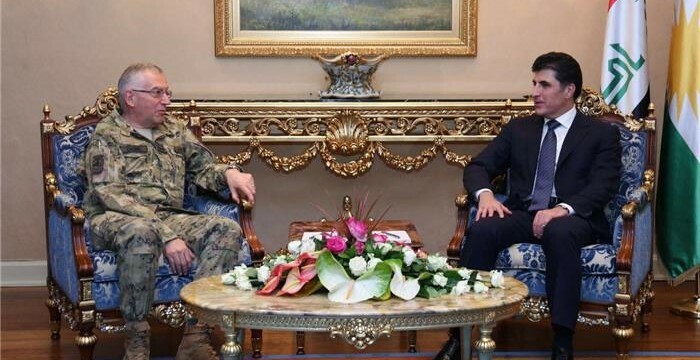 Erbil, Kurdistan Region, Iraq (cabinet.gov.krd) – Kurdistan Region Prime Minister Nechirvan Barzani received General Claudio Graziano, Chief of Defence Staff of the Italian Armed Forces, and his accompanying delegation. General Graziano expressed his satisfaction with the level of cooperation and coordination between the Peshmerga and Italian forces, especially in the area of Mosul Dam, where Italian troops are deployed to protect the dam and an Italian company in charge of reparation of the dam. Discussing bilateral relations, General Graziano reiterated that his country will continue its support for the Peshmarga forces. Prime Minister Barzani expressed his appreciation to the Government of Italy for its support to the Kurdistan Peshmerga forces and praised the role of its forces in protecting the Mosul Dam. He also commended the strong cooperation and coordination between the Peshmerga and the Italian forces. The two sides also discussed the latest regional developments, the operation to liberate the city of Mosul from ISIS, the relationship between Erbil and Baghdad and Kurdistan Region’s decision to hold independence referendum in September. 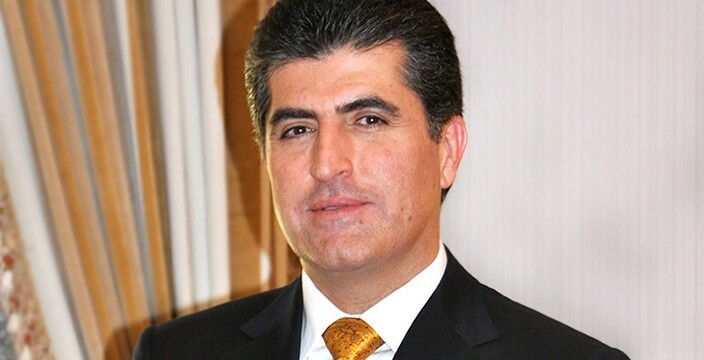 Erbil, Kurdistan Region, Iraq (cabinet.gov.krd) – In a statement, Kurdistan Region Prime Minister Nechirvan Barzani strongly condemned the terrorist attack in Tehran. I strongly condemn the terrorist attack that targeted Iranian parliament and Imam Khomeini shrine, earlier today in Tehran. The people of Kurdistan have been and are at the forefront of the war against terrorism, from which they have greatly suffered. Therefore, they understand the suffering of the families of the victims, the people and government of Iran. I extend my condolences to the families of the victims, the people and the government of the Islamic Republic of Iran, and wish a speedy recovery for the wounded victims. Terrorists, wherever they are, take advantage of any opportunity to carry out their malicious and evil plans and do not hesitate to kill innocent people regardless of their religious belief or nationality. As terrorist attacks continue to rise in many places across the world, the international community has to take stronger measures and adopt greater cooperation in order to confront terrorism and its ideology. Once again, we express our sorrow and share the pain of the families of the victims and the Islamic Republic of Iran. In a statement, Kurdistan Region Prime Minister Nechirvan Barzani strongly condemned Saturday’s terrorist attack in London. I strongly condemn the terrorist attack that took place last night in London, which killed and wounded a number of civilians. I extend my condolences to the families of the victims, the people and the government of the United Kingdom, and wish a speedy recovery for the wounded victims. Kurdistan Region Prime Minister Nechirvan Barzani met Russian President Vladimir Putin on the sidelines of the St. Petersburg International Economic Forum. President Putin valued the development of ties between the two sides, particularly in the economic field. Noting that terrorism has become a global issue, President Putin praised the Kurdistan Region for the way it has been conducting the fight against the Islamic State terrorist group, ISIS. Regarding cooperation in the field of energy, President Putin said that he supports the agreements signed between the Kurdistan Regional Government and the Russian oil companies. He expressed his support for further strengthening these relations. Prime Minister Barzani expressed his appreciation for the warm reception and his pleasure to further developing the relations between Russia and the Kurdistan Region. He reiterated his government’s support for Russian companies wishing to invest in various fields in the Kurdistan Region. He also thanked Russian President for his country’s support in the war against ISIS terrorists.